During my years of study in seminary, I worked at a funeral home. It was the best laboratory in which to learn the Bible and theology. Frequently, I saw dead bodies and attended funerals as I helped direct the families and friends of person after person to a hole in the ground where a once vibrant life would find its final resting place in a cemetery. One night as I was reading through Millard Erickson’s Christian Theology, a phone call came from Houston, Texas informing me that an entire family had been killed in an automobile accident. I remember the shock as I wrote the details of the incident. The bodies of a mother, a six-year-old boy, a four-year-old girl, and two 18-month-old twin boys were on the way to the funeral home where I worked. The father was just about to be told what had happened to his family by the police department. I’ve never forgotten that experience, and I’ve never forgotten what the funeral home parlor looked like when I saw three caskets open containing the lives of five people who died a horrible death. I was young (23 years old), but I had already experienced death in my own life. By this age, my father, mother, and brother had all died tragically. Two of my uncles had died and one of my cousins was killed when he was five years old. One of my best friends from high school was killed in an automobile accident. I’ve also experienced the death of relationships and the loss of jobs. By the time I was 30, life had become a series of losses that shaped my worldview in ways I once thought impossible. 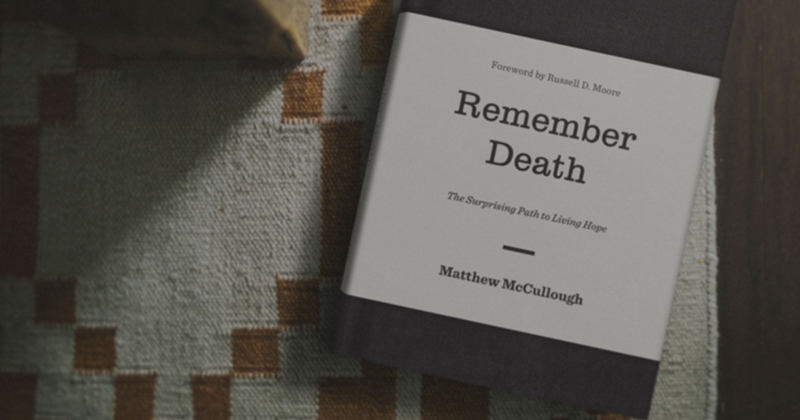 I wish Matthew McCullough’s book, Remember Death: The Surprising Path to Living Hope, was available to me back then. Now, at 50, I am able to better understand all that death has taught me, and this book has been the catalyst for a deepened hope in the promises of God in Jesus Christ. But just what about this book is all that helpful? There are numerous titles about death and dying. The grief industry is a subculture all to itself. What is it about McCullough’s thoughts that are even worth reading in an already crowded space? Observe the modern Evangelical movement, and just beneath the surface, you see a pronounced death-avoidance. Some of the largest churches in the United States are led by pastors who preach the exact opposite of what McCullough writes in this book. Health, wealth, harmony, and prosperity are seemingly the byproducts of an accurate Christian theology. McCullough is aware of that, and he uses a skillful pen to dismantle these thoughts built on such flimsy scaffolding. The book kindly bludgeons its reader. Yet, it is a mercy. “The truth is that nothing lasts, that you can never go back, and that therefore everyone loses everything to death.” Think about this for more than five minutes and it becomes disorienting. What exactly is the value of my life? This is where McCullough pushes hard. Death raises questions about where our place actually is. Besides an organic mass that eats, sleeps, reproduces, and decomposes, who am I? What is the value of a life that doesn’t even exist in someone’s memory? The question is this: if my life turns to dust in the end, am I more significant than the stray dog picked apart by buzzards, the goldfish flushed down the toilet, or the cockroach crushed under foot? You still end up dead, just like the animals. In the end, no one resists nature. So, remind me, where do you get this idea that humans matter more than animals do? McCullough is a pastor in a university city. Holding a Ph.D. in history from Vanderbilt University, he stands before doctors, lawyers, and aspiring business leaders in the prime of their life every week in a rented school auditorium just off the Vanderbilt campus and teaches them about Jesus and the promises of God. He does this week after week not because he couldn’t do something else (he could), but because reading, thinking, and studying deeply about the Bible’s words has created a crisis of sorts for him that is not unique to him. The truth is that life works like a savings account in reverse. Zoomed out to the span of an entire life cycle, you see that no one is actually stockpiling anything. You’re spending down, not saving up. Everything you have—your healthy body, your marketable skills, your sharp mind, your treasured possessions, your loving relationships—will one day be everything you’ve lost. McCullough knows what he is up against. Modern culture lies to modern people. And in order to fully experience joy in this dying life, a new way of thinking must be learned. It is not automatic, and it does not come naturally to human beings—especially to the modern “church” culture that has been taught life is a continuing series of successes and wins. Knowing this, he helps his readers trace their thoughts home to their logical conclusion. By doing so, he helps Christians better know, understand, and apply the promises of God in the future to the problems of the present. He does this by clearing away cobwebs around areas of the Bible often avoided. Case in point: the changing of the water to wine at the wedding in Cana—John 2. Far too often (if this text is even read or preached) this account in John’s Gospel is not understood for the true “sign” it is. “Packed into what may seem like a little random or offhanded showboating is a concentrated version of everything Jesus came to do,” he writes. This miracle is vitally connected to Isaiah 25 where the promise of God to remove death and its sting forever is clearly promised to the people of God. It is an incident packed full of meaning that points to the promise of Jesus to remove the ultimate experience of loss so that eternal life—both a quantity of life (eternal, never dying) and a quality of life (“a life beyond the reach of death”)—can be experienced by all who trust in him. Ever the exegete, he is careful to mine the truth of the trajectory of John’s Gospel for his readers. With every turn of the page, McCullough’s readers are led first to the precipice and then to the promise (you really can’t appreciate the power of the latter without realizing the peril of the former). Jesus helps people “understand where his signs are pointing” all the while he is “warning of what blinds” them to his work. Many modern readers will find themselves numbered with the crowd who hurried to Jesus for yet another free meal (see John 6:26). “You’ve seen my power, but missed my point,” McCullough writes in what is surely the best phrase to explain so many modern readers of the Bible. The Christian hope hinges on the resurrection of Jesus Christ from the dead. Nothing else will do. No other hope can provide anything other than a growing nihilism. Discontentment, envy, and anxiety are exposed for the frauds they are and how they rob life of its joy because they feed on what dies a little more with each passing day. By admitting the horror of the present life, McCullough reframes grief as he brings forward words from the past into the sorrows of the present so that the promises for the future can comfort and bring true and lasting joy. Moving from honesty to grief to hope is the clarifying process of growth in the grace and knowledge of Jesus Christ. All who walk in this way will find an anchor for their soul even as their body dies. Douglas E. Baker is Tenth Presbyterian Church’s current Church Administrator, having joined the team in 2018. He enjoys history, theology, and Chick-fil-A. He holds degrees from LSU, Johns Hopkins, and New Orleans Baptist Theological Seminary. Originally posted on Tenth Presbyterian Church website on Jan. 15, 2019. Republished by permission. By the age of twenty-one, Charles H. Spurgeon was arguably the most popular preacher in London. His passion and gift for proclaiming the gospel did not limit him to pastoral duties within one congregation; rather, they stimulated him to found Sunday schools, churches, an orphanage, and the Pastor’s College. Possessing a simple yet profound understanding of how God views His children, Spurgeon would often proclaim the Church glorious. In two sermons on Luke 15:20 titled, “The Prodigal’s Reception” and “Prodigal Love for the Prodigal Son,” he tells how the Father looks upon and receives His child who is in sin—a picture of how Christ transforms wretched sinners into His bride, the Church, purified. The grace of God, explained “The Prince of Preachers,” produces a grateful people who stand ready to “face the world” and serve their Master with joy. 1 C. H. Spurgeon, “The Prodigal’s Reception, Luke xv. 20,” Miracles and Parables of Our Lord, vol. 3 (Grand Rapids: Baker, 2003), 377-378. 2 C. H. Spurgeon, “Prodigal Love for the Prodigal Son, Luke xv. 20,” Miracles and Parables of Our Lord, vol. 3 (Grand Rapids: Baker, 2003), 382. 3 “Prodigal Love for the Prodigal Son,” 383-384. 5 “The Prodigal’s Reception,” 380. HAMILTON, Bermuda—Actor John Rhys-Davies (Gimli in The Lord of the Rings trilogy) has partnered with the website BibleMesh.com as narrator of The Biblical Story, an online Bible survey course that explains how all of Scripture points to Christ. The Bible is “a book that, even if you haven’t read it, has had an influence on your life,” Rhys-Davies said in the docudrama KJB [King James Bible]: The Book that Changed the World. Joining Rhys-Davies in The Biblical Story’s 90-minute overview video is New York pastor and author Tim Keller who teaches the biblical theology throughout the video. Eric Metaxas, author of the bestseller Bonhoeffer, co-authored the video script along with King’s College President Greg Thornbury. The Biblical Story is entirely online and does not require any downloading or printing of material. It is being used as a textbook replacement in colleges and seminaries around the world. In addition to the overview video, the course provides commentary by a host of noted evangelicals: Hundreds of one-page articles introduce key Bible ideas while short teaching videos expound crucial points. Among the personalities featured are Alistair Begg, senior pastor of Parkside Church in metropolitan Cleveland; Philip Ryken, president of Wheaton College in Illinois; J. Ligon Duncan, newly elected chancellor of Reformed Theological Seminary in Jackson, Mississippi; and Christopher Ash, director of London’s Cornhill Training Course. Biblical theology taught by pastor/author Dr. Tim Keller. Home for Bible Translators (HBT) can be found nestled in the Judean hills just outside of Jerusalem in Yad haSh’mona. Mother tongue Bible translators from 35 different countries have made the journey from their own countries to HBT to learn the language of the Bible in the land of the Bible so that they are better equipped to undertake the important work of Bible translation when they return home. Hebrew language study for HBT Bible translators is based at the Hebrew University of Jerusalem. In the most recent course, however, HBT has partnered with BibleMesh Biblical Languages so their students, coming from many different countries, can supplement their Hebrew language study with BibleMesh’s text based, inductive language program, as well as continue to use the program once they return to their home countries. In the video below Hal Ronning, the director of HBT, talks with Timothy Edwards about the work and ministry of HBT as well as how BibleMesh has helped in training their students in the important work of Bible translation. Greg Thornbury is the Dean of the School of Theology and Missions and Vice President for Spiritual Life at Union University in Jackson, TN. He also serves as editor for the “Q&A on the Bible” section of the BibleMesh Blog. BibleMesh aims to help people understand the big picture as well as important facts of the Bible. The first BibleMesh resource is “The Biblical Story,” a course that presents Scripture as a cohesive narrative of God’s work in the world from Genesis to Revelation. It utilizes an interactive quizzing tool that helps people remember what they have learned. And finally, it includes a social networking platform which will allow pastors and church leaders to host their own online Bible studies and contribute their own resources. Forthcoming content will include courses in Biblical Greek and Hebrew. Why Were People Healed from Touching Jesus’ Clothes? Can Archaeology Help Confirm the Bible? Have a question about the Bible? Ask us! Tweet your question to @biblemesh with the hashtag #BibleQA or email us.